Escape the chill of winter and celebrate the 1,000,056th birthday of art and the opening of the anyWare installation. At exactly 3:10 pm a special guest will connect to NAISA remotely and collaborate with those at NAISA to play the anyWare sculpture. Listening in to the interaction will be a Satellite radio audience in Europe as part of the Euroradio Ars Acustica special broadcast of Art's Birthday parties from around the world. 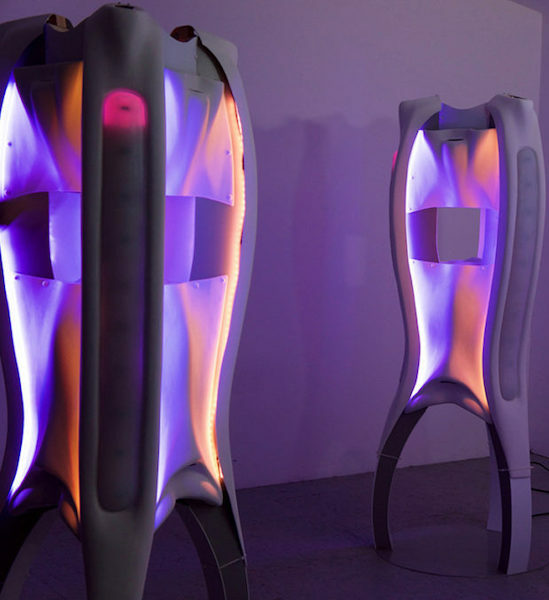 anyWare is an Internet of Things distributed sculpture comprised of two identical objects and one virtual online portal that telematically connect different locations in the world and enable distant physical communication. Structuring these interactions are a number of games and puzzles for people to play/solve, either individually or collaboratively. The objects transform in the experience of exploration (either with one person or potentially with many people) and in so doing reveal different levels of interactivity and aesthetic experience. The creation and production of anyWare would not be possible without the support of the Canada Council for the Arts, Ontario Arts Council and The Social Sciences and Humanities Research Council of Canada (SSHRC). NAISARadio "Off the Beat(en) Track"
Journey in your mind to a place ‘off the beaten track’ and explore an eclectic range of radio and sound art from around the world. NAISARadio will be broadcasting works responding to NAISA's 2019 programming theme of 'Off the Beat(en) Track.' In addition, NAISA will be playing other past programming that resonates with this theme. Highlights of the 2019 collection can also be heard on NAISA's Deep Wireless 14 Soundcloud album. The Deep Wireless 14 Online Album was produced by New Adventures in Sound Art (NAISA) for the 2019 edition of the annual Deep Wireless Festival of Radio & Transmission Art. The contents of the album were curated by NAISA from an international call for submissions on the theme Off the Beat(en) Track. A vision of Macbeth in life and death: four dying gasps release a torrent of sound. In part one we meet the man of evil, a rich setting. The second part presents the eternal Macbeth, now he is a she, tormented by self hatred. The end returns the beginning. Gateway invites listeners to feel the ecological and social changes affecting the Kiewa Valley and High Country in Australia. It is created by little stories that describe the relationship between people and their environment. Gateway is a sound art project produced by the Bogong Center for Sound Culture. Fieldwork was made possible with the assistance of B-CSC's supported residency program, French Institute and the municipality of Toulouse. Tsikatsii. A large grasshopper with a loud percussive wing flap. Original field recording of Tsikatsii made on Blood reserve Kainaii, Southern Alberta. Kime Ani are words in the Tahltan language, translated to mean "home coming" or also "let’s go home." Included here is a seven part electronic work created from a selection of vintage audio samples from Edzi'u's three generations of grandmothers and matriarchs, recorded as early as 2017 and as late as 30 years ago. Time has different meanings. We have our own biological time and psychological time. The working time measures our daily routines. Mass and energy warps space and time. Quantum theorists studying the fourth dimension propose that time can bend, allowing us to glimpse the future. 'Time Anomaly' is influenced about the concept of time and the work is a study about the common time machine, the clock. The sound source of the work is just one clock and its ticking sound (60 bpm) which is manipulated with the help of granular synthesis. A recording of a live micro-FM transmission performed at the Lizard Wireless Telegraphy Station, Cornwall: site of Marconi’s first ‘over-the-horizon’ wireless transmission in 1901. The composed transmission is based on field-recordings collected on the Lizard Peninsular, a landscape littered with the architectural remains of listening and communication. Haunted by the did-dit-dit of Marconi’s test signal tapped out on the towers and blast walls of these architectural ghosts, the emerging soundscape mingles local sounds with others recorded on the Isle of Wight, from where Marconi’s original signal had arrived. The transmission begins as the first illuminated arc of the Lizard Lighthouse signals nightfall.